SUMMARY: Diffusion imaging acquired with echo-planar imaging (EPI) is usually performed with parallel imaging to reduce geometric distortions, especially at high fields. This study reports the occurrence of pseudolesions in EPI with parallel imaging. The unfolding artifacts are attributed as arising from a mismatch between RF sensitivity profiles and distorted acquisition data in the presence of susceptibility effects, plus strong signals on the b = 0 images. Examples of pseudolesions from the eyeballs are shown, and remedies are suggested. Diffusion tensor imaging (DTI) has been widely used in the study of white matter-related diseases.1–3 Single-shot echo-planar imaging (EPI) is usually the preferred technique to acquire diffusion tensor data because of good signal-to-noise ratio and rapid acquisition. The susceptibility-induced geometric distortions inevitable in EPI images could be substantially reduced with parallel imaging,4,5 which has become increasingly popular, especially at high-field strengths. However, it must be noted that when using parallel imaging, unfolding artifacts may occur in the presence of imperfect sensitivity profiles for the radiofrequency (RF) coils,6 leading to possible confusion in image interpretations. In this study, we investigated another source of unfolding artifact in parallel echo-planar DTI, which manifests itself as a pseudolesion on the calculated maps of apparent diffusion coefficient (ADC) and fractional anisotropy (FA). The artifacts could arise even with perfect RF coil sensitivity profiles. We also propose a simple solution to remedy the artifacts. In parallel imaging acquisition with sensitivity encoding (SENSE),7 the aliasing arising from a reduction in the number of phase encoding (Fig. 1A) is unfolded through a linear decomposition process, based on different aliasing patterns received by individual coil elements (Fig. 1B).8 Therefore, previous knowledge of the sensitivity profile for each RF coil element is critical for artifact-free unfolding. The coil sensitivity profile is usually estimated by acquiring a proton-attenuation-weighted gradient-echo image, following which a low-pass-filtered version of the undistorted image is used for SENSE unfolding. In EPI acquisitions, susceptibility-induced geometric distortions along the phase-encoding direction are prominent in the presence of field inhomogeneity, especially at the skull base. When the distorted EPI image is to be SENSE-unfolded with use of undistorted sensitivity profiles, the mismatch may very likely lead to imperfect SENSE reconstruction and, hence, unfolding artifacts, as illustrated in Fig 1D. Simulation of parallel imaging at acceleration factor of R = 2 by using perfect/imperfect sensitivity profiles. Image of object (A) was acquired by 2-channel RF coils. Each accelerated raw image (B1 and B2) shows an aliasing pattern due to reduced FOV, which could be unfolded correctly if sensitivity profiles are perfectly obtained (C). With erroneous sensitivity profiles, unfolding artifacts would take place, showing an aliasing pattern spaced at FOV/R from the original object along the phase-encoding direction (D). On SENSE-DTI images, the eyeballs are one prominent source of the unfolding artifacts on b = 0 EPI images due to 2 factors acting together. First, the eyeballs are rich in water protons, giving bright signal intensity on T2-weighted b = 0 images. Second, the eyeballs are close to the paranasal sinus, where the strong susceptibility leads to severe geometric distortions of the eyeballs on EPI images. Strong distortions result in the previously mentioned mismatch phenomenon between EPI and the undistorted RF coil profiles, giving rise to unfolding artifacts that are further magnified by the bright signal intensity. In contrast, essentially no unfolding artifacts are visible on diffusion-weighted images because the eyeball signal intensity is strongly attenuated. Consequently, the ADC value calculated from artifact-contaminated b = 0 and artifact-free diffusion-weighted images tends to be erroneously estimated. Similarly, the FA derived from 6 erroneous ADC values would become inaccurately measured, causing pseudolesions that may mislead clinical diagnosis. We performed experiments to investigate the phenomenon of pseudolesions from unfolding artifacts in SENSE-DTI. We acquired data on a 3T MR system. For DTI, 6 noncollinear diffusion-weighted images with a b value of 1000 s/mm2 and a single b = 0 image were acquired with TR, 6000 ms; TE, 80 ms; FOV, 25 cm; matrix size = 112 × 112; NEX = 4, and a SENSE acceleration factor R = 2, 3, and 4. To verify the source of unfolding artifacts from the distorted eyeballs, we acquired another set of images with a remedy method by applying a saturation band at oblique angulations over the eyeball region to saturate the signal intensity (Fig 2). Other than the saturation band, all parameters were kept the same as for DTI acquisition. 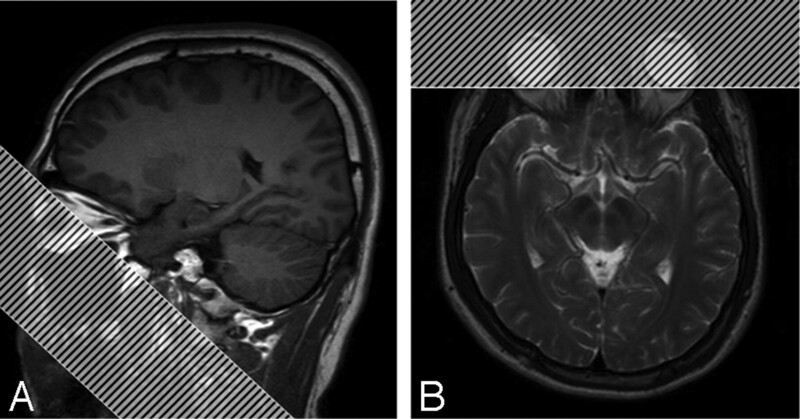 Sagittal (A) and axial (B) views of the saturation band applied over the eyeball regions to eliminate unfolding pseudolesions in parallel imaging. The saturation band was placed near the borderline of the skull base to avoid accidental suppression of signals from the brain tissue. The b = 0 SENSE-EPI images with bright eyeball signal intensity and serious distortion suffered from unfolding artifacts, as shown in Fig 3. The susceptibility-induced, ghost-like artifacts showed spatial displacements consistent with the unfolding artifacts in parallel imaging at FOV/R along the phase-encoding direction, where R was the acceleration factor (Fig. 3, top row, arrows). However, in the high b-value (1000 s/mm2) diffusion-weighted images, the unfolding artifact was visually absent (Fig. 3, second row) because the diffusion-sensitizing gradient attenuated the eyeball signal intensity. 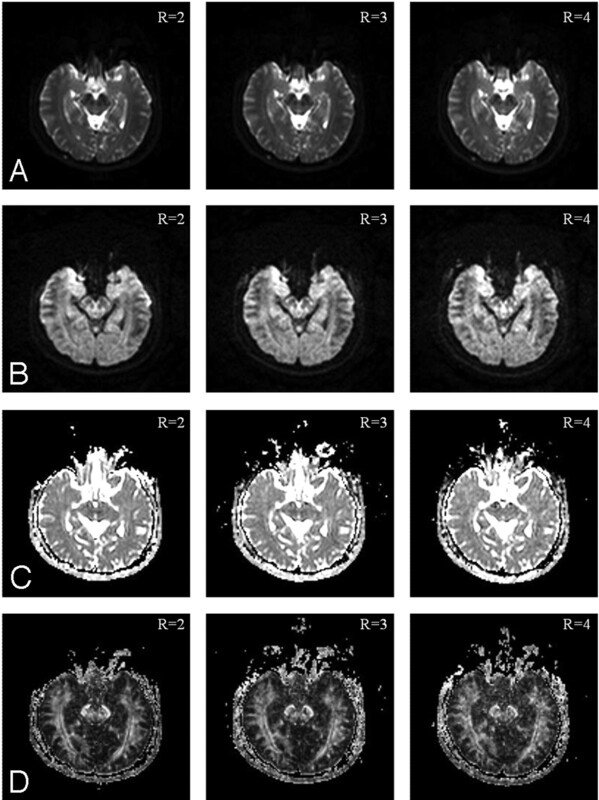 Consequently, the DTI image reconstruction with use of the artifact-contaminated b = 0 and 6 artifact-free b = 1000 images gave rise to the ADC and FA maps showing pseudolesions (arrows in third and bottom rows of Fig. 3, respectively). With a saturation band placed over the eyeball region, signal intensity from the distorted eyeball images became saturated. Therefore, no unfolding artifact was present in the b = 0 and b = 1000 images (Fig. 4, two top rows). Therefore, the pseudolesions were removed in the calculated ADC and FA maps (Fig. 4, two bottom rows). The b = 0 images (top row) acquired with SENSE parallel imaging at acceleration factors of R = 2, 3, and 4 (left to right columns, respectively) show ghosting from the eyeballs, displaced spatially along the phase-encoding direction at FOV/R, consistent with SENSE unfolding artifacts (first row; arrows). 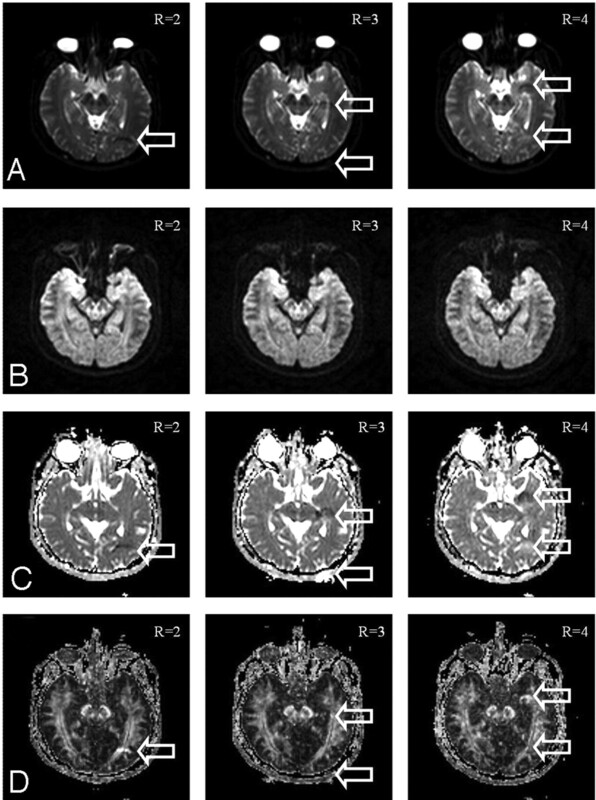 The corresponding b = 1000 diffusion-weighted images exhibit no artifacts (second row), hence resulting in pseudolesion intensity in the ADC and FA maps mimicking diffusion abnormality (third and bottom rows, respectively; arrows). In the same arrangement as Fig. 3, the b = 0 and b = 1000 images, and the ADC and FA maps (top to bottom rows, respectively) obtained with the saturation band to suppress the eyeball signals show no pseudolesions. DTIs are frequently acquired with the use of single-shot EPI sequence in clinical practice. Although parallel imaging could substantially reduce susceptibility-induced geometric distortions in EPI, residual ghost-like artifacts from imperfect unfolding are inevitable. In this study, we have shown that the mismatch between undistorted sensitivity profiles and distorted image data could result in pseudolesions on the ADC and FA maps from the eyeball signals. Although an erroneous diagnosis can be easily avoided by reviewing the original diffusion-weighted images in addition to the ADC and FA maps alone, care must be taken in voxel-based group comparison,9,10 longitudinal studies,11 or even multicenter trials. Therefore, it is very important to reduce unfolding artifacts in DTI when using parallel acquisition. Similar to SENSE-DTI, parallel imaging methods based on the technique of simultaneous acquisition of spatial harmonics (SMASH),12 which reconstructs the image in the k-space domain, are anticipated to encounter the same mismatch problem (or equivalently, phase errors in k-space) in EPI in the presence of strong susceptibility distortions. The inference is an expected result because image reconstructions with SENSE and SMASH parallel imaging algorithms are both based on accurate measurements of the RF coil profiles of each coil element. Therefore, a reasonable match between the RF coil profile and the original images is a prerequisite for artifact-free parallel imaging, no matter what algorithm is used. For the pseudolesions arising from ghost-like artifacts of the eyeballs, we have shown that the application of a simple saturation band can effectively remove the unfolding artifacts and therefore improve the accuracy of the ADC and FA maps. However, it must be noted that the eyeballs are merely one of the many sources of pseudolesions in parallel imaging and are relatively easy to remedy because of the simple geometry of the eyeballs. Other regions such as the skull base and the frontal pole also suffer from susceptibility distortions. Hence, in the presence of strong signals on the b = 0 images simultaneously (eg, from the CSF in the ventricles and cisterns), similar pseudolesions may occur when parallel imaging is used. A simple saturation band, however, would be unable to completely eliminate the unfolding pseudolesions in this case. Moreover, it is possible that the situation for cisterns is even more complicated. When the ghost-like signals are not sufficiently strong to cause visually prominent artifacts but lead to only slight alterations in the ADC or FA values, an accurate differentiation of artifacts from pathologic processes would become difficult, if not impossible. Remedies to the unfolding artifacts in parallel EPI include the following 3 methods: 1) suppression of the strong b = 0 signals, 2) matching of the RF coil profiles with the acquired images, and 3) reduction of EPI geometric distortions via improved shimming. Use of the saturation band to remove the eyeball signals illustrates the first method. In cases in which the unfolding artifacts originate from the CSF, the combination of fluid-attenuated inversion recovery with DTI acquisition13–15 is preferred to the saturation band method, at the expense of prolonged scan time and slightly reduced signal-to-noise ratio. Matching the RF coil profile by acquisition by using EPI with the same phase-encoding bandwidth (ie, equal distortions) is an alternative option but is often beyond the radiographer's control. As a result, when combining parallel imaging with EPI acquisitions, high-order shimming is strongly suggested. High-order shimming helps to not only reduce susceptibility distortion but also improves fat suppression, the presence of which could both lead to unfolding artifacts in parallel imaging. In conclusion, we have demonstrated that in the presence of strong susceptibility distortions in EPI, particularly the eyeballs, parallel imaging could lead to pseudolesions on both ADC and FA maps. Careful shimming to reduce distortions, or the use of a saturation band to suppress the eyeball signals, provides a simple way in clinical applications to eliminate the pseudolesion artifacts. Supported in part by the National Science Council under grant NSC-95-2314-B-002-221-MY3. Accepted after revision January 22, 2007.